Come enjoy Thunder Over Patoka at Patoka Lake this Independence Day weekend! Fireworks will start from the beach area inside the main entrance (Newton Stewart SRA) at dark on Saturday, June 30, 2018. 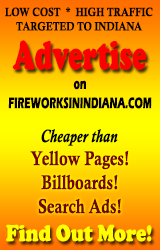 Fireworks can be seen from the beach or on the water in your boat.